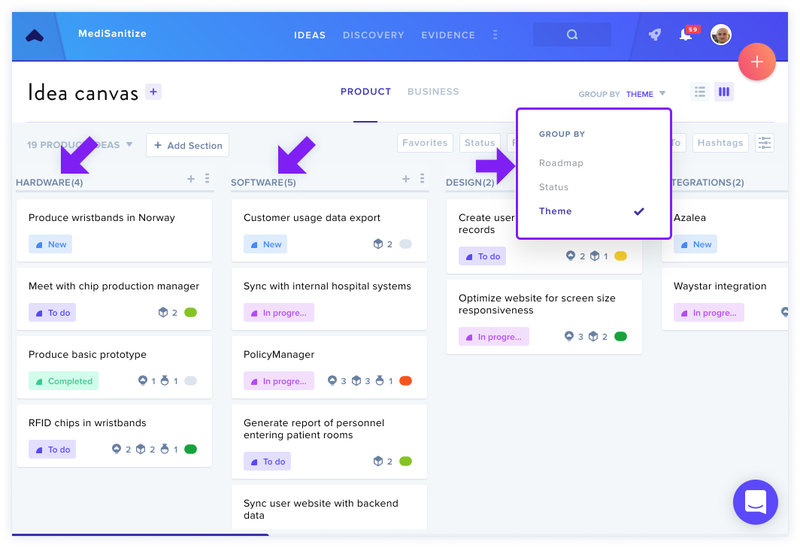 The Product Canvas is a new feature that allows you to capture feature ideas, user stories, and other product ideas directly in GLIDR. You can click the icon in the upper-right to switch between the List View and the Kanban View, where you can see your Product Idea cards in columns. 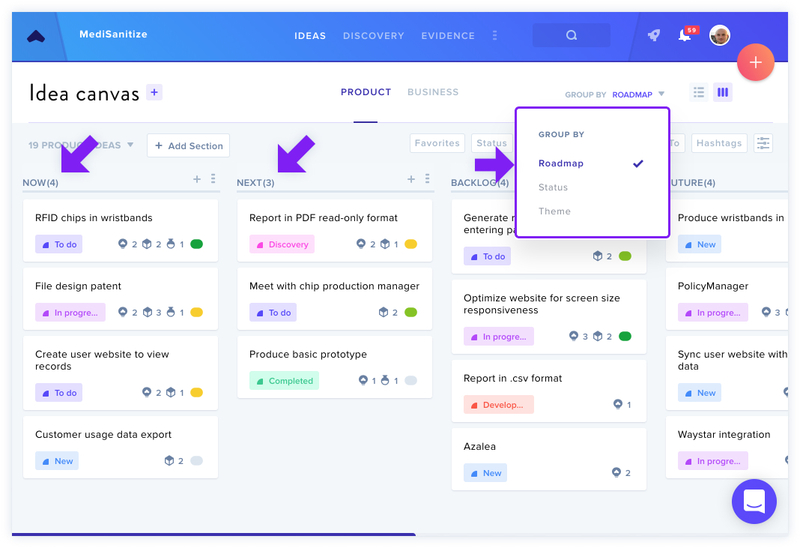 The Roadmap View displays columns of ideas based on time and priority within your high-level feature map. 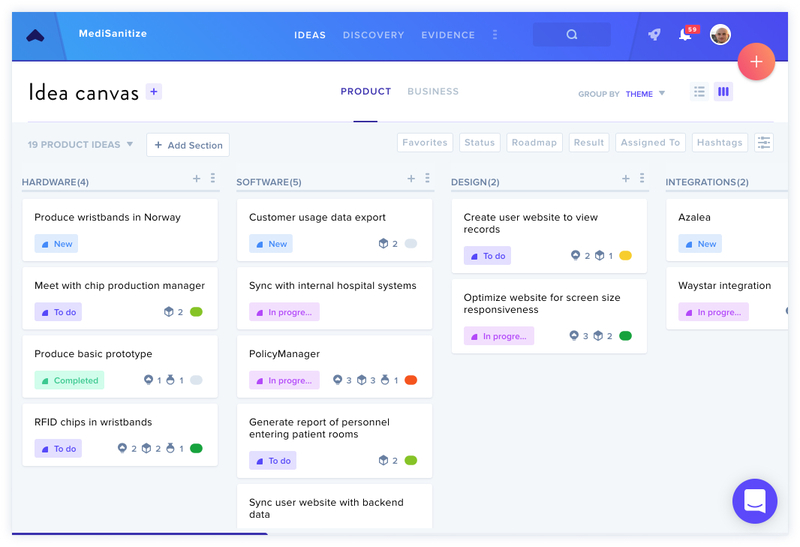 You can use the Product Canvas to organize ideas in a Kanban board and move them through stages like Now, Next, and Future or Backlog, Current, and Done. You can customize these names depending on what your team uses by clicking the column titles. The Status View shows the ideas grouped by their status within your high-level timeline. You can see which ideas are being tested and for which ideas the testing is complete. You can give ideas a status category for more granularity than the roadmap category. The Theme View displays your ideas grouped by theme. 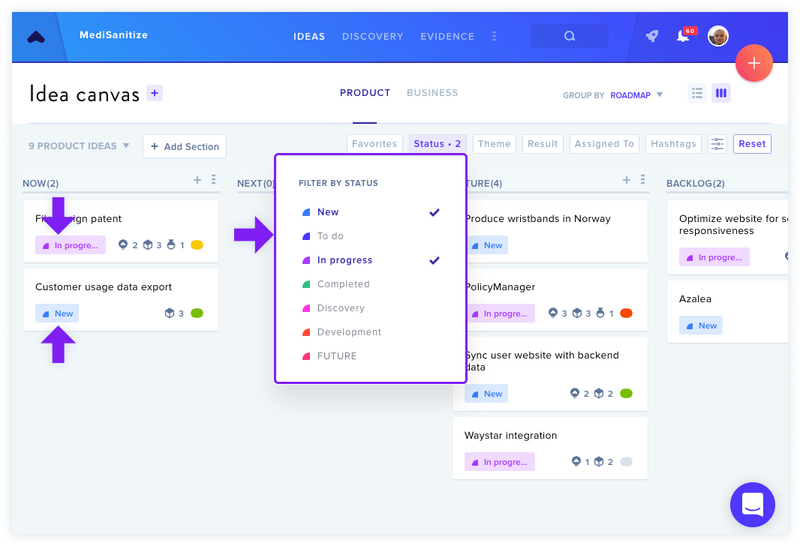 The default theme is "no theme" but you can create your own feature categories like desktop or mobile based on which themes make sense for your product. To add new columns, scroll to the right and type the title where it says "Add new". You can rearrange columns by dragging them into any order you'd like. If you want to delete extra columns, clicking the ... (more) icon beside the title and then click Delete Section. You can also make these changes in Canvas Settings. Access Canvas Settings by clicking the ... (more) icon in any column and select Customize in Settings. Here, you can also add and remove columns, reorder them, and rename the sections. These settings are also accessible via Profile Icon > Team Settings. We've built more powerful filters that allow you to easily pare down and see your Ideas. Select as many filters as you want to only display the filtered ideas on your Canvas. Ready to learn more about List View?